--Until 10 p.m... Eastern Bergen, Western Essex, Eastern Passaic, Western Union. --Until 4 a.m... Western Bergen, Western Passaic. --Until 9 a.m... Morris, Sussex, Warren. Why? The forecast is trending slightly colder for this afternoon and evening. So the snow and wintry mix may very well last longer than originally expected. That bumps up the expected snowfall accumulation by an inch or two. Once the upper limit of the NWS forecast hits the 7" threshold... BAM, it's Warning time. Once again, the bottom line for this storm remains the same. Probable travel disruptions in North Jersey. 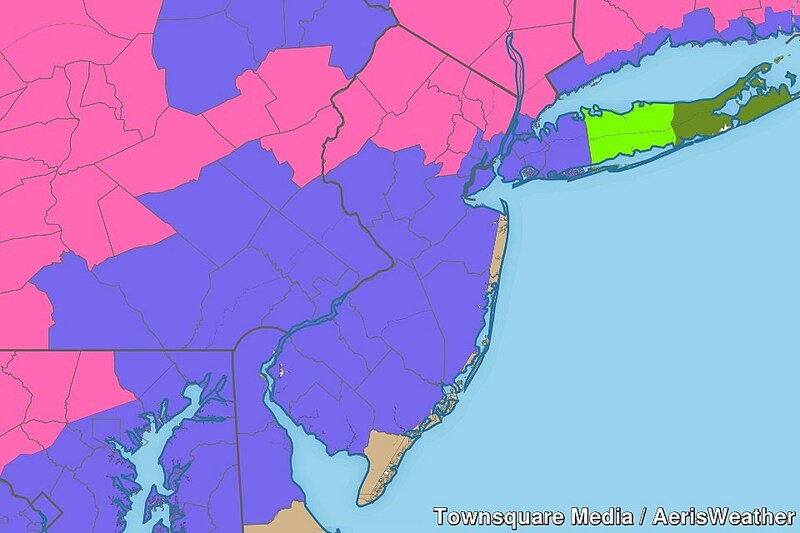 Minor nuisance snow and ice in central and southwestern New Jersey. Just plain rain along the coast. And no matter what's falling from the sky — wet or wintry — this evening's commute could be a real challenge. Stay tuned for additional updates during and after the storm. Be smart and stay safe!